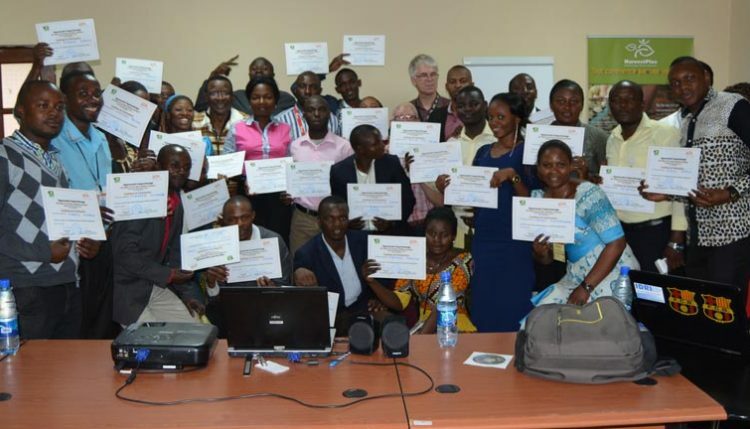 The IITA-Central Africa Hub and the Technical Center for Agricultural and Rural Cooperation (CTA) organized its first training on ICT and social media for Agribusiness and Marketing in DR Congo. The training was held at Kalambo on 20–24 June. The training participants consisted of IITA Kalambo Youth Agripreneurs (IKYA), youth value chain actors, and civil society groups active in agribusiness. Youth Agripreneurs display their certificates of participation after the training. The training was facilitated by Mireille N’simire (ICT Specialist) and Kathy Kalala from Airtel DR Congo, who provided tips on how to win customers in agribusiness. She also shared the success of IKYA’s digital marketing tool using the Airtel Platform. In his remarks, Chris Okafor invited participants to actively and intensively participate and take advantage of the opportunity offered by IITA and CTA. He informed the young Agripreneurs that “youth in agriculture” was the center of discussions during the 7th Africa Agriculture Science Week held in Kigali, 13-16 June. This initiative has helped in the adoption, institutionalization, and dissemination of appropriate, low-cost, simple, and replicable Web 2.0 and social media applications for stakeholders identified as priority targets within the CTA Regional Business Plan for Central Africa. It has also improved the skills and increased awareness among development actors on Web 2.0 applications and social media learning opportunities. Several online agribusiness markets were launched during the training. IKYA online markets can be accessed here or here. The training also gave the participants the opportunity to develop their online agribusiness marketing strategy to increase their revenue.